Circle, Ellipse, Parabola, Hyperbola. These are all names familiar to anyone who has had high school analytic geometry. They are the four conic sections, known to the ancient Greeks. The word section means to cut or divide into sections, so conic sections are cuts, or cross sections of a cone. Though they can arise in any cone, traditionally they are considered as coming from a right circular cone (a cone whose axis is perpendicular to its base). 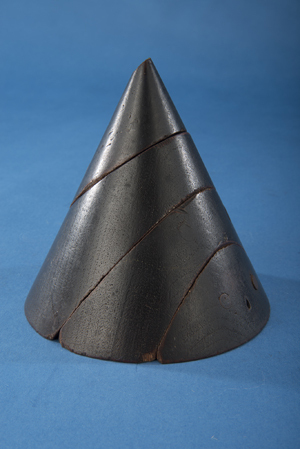 The model pictured in figure 1 is of a wooden right circular cone and shows the conics sections as they arise when the cone is cut by a plane. A circle is formed when a plane cuts the cone parallel to the base or perpendicular to the axis of the cone. The other three conics are formed when the cutting plane is no longer parallel to the base (or perpendicular to the axis). After the circle, the next conic section encountered in school is the ellipse. The word ellipse comes from the Greek elleipsis and means “to fall short”. An ellipse is formed when the cutting plane meets the base at an angle less than, or falls short of, the angle formed by the base and the side of the cone. In figure 1 above, notice how the angle the section makes with the base, if it were extended, is more shallow than the angle the side of the cone makes with the base. Thus it “falls short”. The cutting plane cuts a complete closed curve which is depicted in the top slice of the model above and in figure 2 below. Parabola comes from the Greek parabole and means “comparison”. A parabola is formed when the cutting plane is inclined to the base at the same angle as the side of the cone (middle cut in figure 1). A parabola does not form a closed curve but a U shape. Finally, the word hyperbola comes from the Greek hyperbole which means to “go beyond” and is formed when the plane cuts the cone at an angle greater than the angle at which the side of the cone meets the base (bottom cut in figure 1). Hyperbolas form very open U or corner shapes. Both a parabola and hyperbola are show in the figure 3 below which shows the middle piece of the conic section model of figure 1. The conics were known to the ancient Greeks. Arches and bridges have been constructed using ellipses and parabolas since the Romans. But scientific applications of the conics (other than circles) were not discovered until comparatively recently. For example, Galileo (1683) realized that any projectile follows a parabolic path, while Kepler (1609) discovered that all planets follow elliptical paths around the son, as opposed to perfect circles as believed since antiquity. In fact, all orbital motion under the influence of gravity can be described using one of the four conic sections based on the mass and speed of the body in orbit. Today, the conics are used to describe the motion of myriads of objects from sub-atomic particles to satellites and whole galaxies. Ellipsographs (also known as elliptographs) are devices used to draw ellipses. Why would you need to draw an ellipse? These curves arise most often in the areas of architectural and engineering drawing as well as in art and graphic design when drawing in perspective. In fact, German artist Albrecht Dürer, known for is precise perspective drawings, invented a compass to draw ellipses in 1540. When drawing plans or blueprints in perspective, a circle when viewed from an angle appears as an ellipse. Many windows, vaulted ceilings, stairs, bridges and arches are elliptical in design and need to be rendered accurately in technical drawings. where a is the length of the semi-major axis and b is the length of the semi-minor. Fig 4. Diagram of an ellipse. The standard description of an ellipse is the set of all points whose distance to the two foci is a constant. In the diagram above, the sum of the distances r1 + r2 is the same for any point on the ellipse. The eccentricity (e) of an ellipse is a number between 0 and 1 that indicates how elongated the curve is. The eccentricity is the ratio of the distance from one focus to the center compared to the length of the semi major axis (e=f/a). For a circle, the foci are at the center and so the ratio is zero (e=0/a=0). Thus a circle is a special case of an ellipse where the two foci have come together. The larger e, the more elongated the ellipse is. If you let e equal 1, your ellipse would end up being a line segment, it would have zero width. An infinite number of different ellipses can be formed by changing the separation between the two foci (which changes how long it is) or by changing the distance r1 + r2 (which changes how wide the ellipse is). The easiest way to draw an ellipse it to take a length of string and tie it to make a loop and place it around two tacks pushed into a piece of paper. With a pencil pull the string taught and start drawing, keeping the sting at the same tension the whole while (figure 5). Since the length of string does not change, the total distance to the two foci remains constant. The curve that results is an ellipse. You can draw a perfect circle by simply using only one pin. Fig 5. 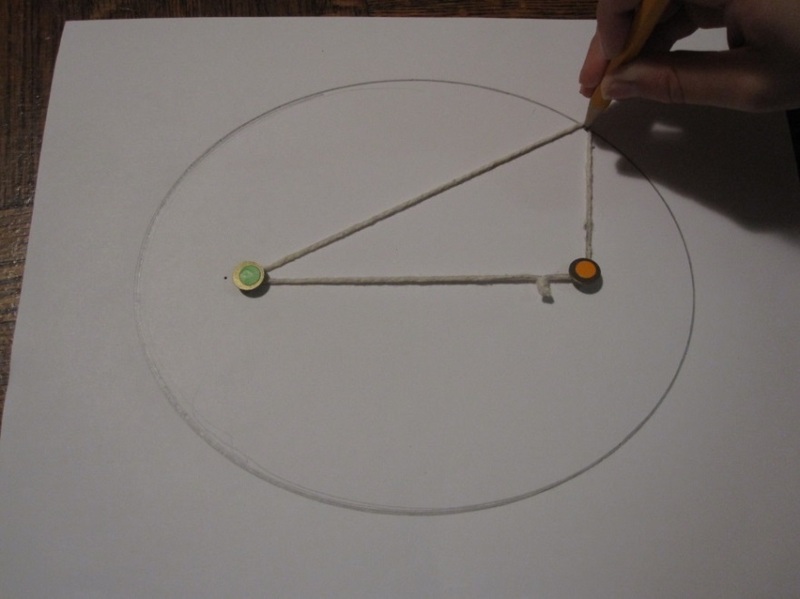 Image of drawing an ellipse using string and pins by the author. There are several mechanical devices that draw an ellipse, but most of them use a method equivalent to this simple string procedure. The simplest ellipsograph used in technical drawing is a template or elliptic curve made of wood or plastic created using a variation on the string method. This type of ellipsograph is static and can only draw one size ellipse but is easy and inexpensive to make. A draftsman may have a set of several sizes of these templates. Item 82.0795.38 is one such elliptic curve and was most likely used in the classroom to draw an ellipse on the chalkboard. The most common device for drawing ellipses is by using an elliptical compass or elliptical trammel, often referred to as the Trammel of Archimedes. A simple version can be found in handmade toy shops and is often referred to as the “do-nothing machines” or a grinder (fig 5). Animations and directions for building one are readily available on-line. As the handle is turned, the two small wood blocks slide back and forth in their tracks. As one moves away from the center, the other moves toward the center. The sum of the distance of each block to the handle remains constant and is twice the semi-major axis, a. A pencil attached to the end of the handle would trace an ellipse. The vast majority of ellipsographs produced are based on the same theory. However, other than the simple trammel, there are more elaborate ellipsographs that produce more precise drawings. The Smithsonian National Museum of American History has eight ellipsographs in its collections. Apart from the single elliptic curve mentioned above, there are three simple trammels (objects 1985.0112.227, 304722.14, 1987.0379.02) and four high precision items (objects 315255, 308981, 308910, 314861). Three of the items are patent models. All date from the mid-nineteenth century to the mid-twentieth century. Gunther, R.T., Handbook of the Museum of the History of Science in the Old Ashmolean Building Oxford, Oxford University Press, Oxford, 1935, p. 66. Hambly, M., Drawing Instruments 1590-1980, Sotheby’s Publications, 1988, pp. 89-95. 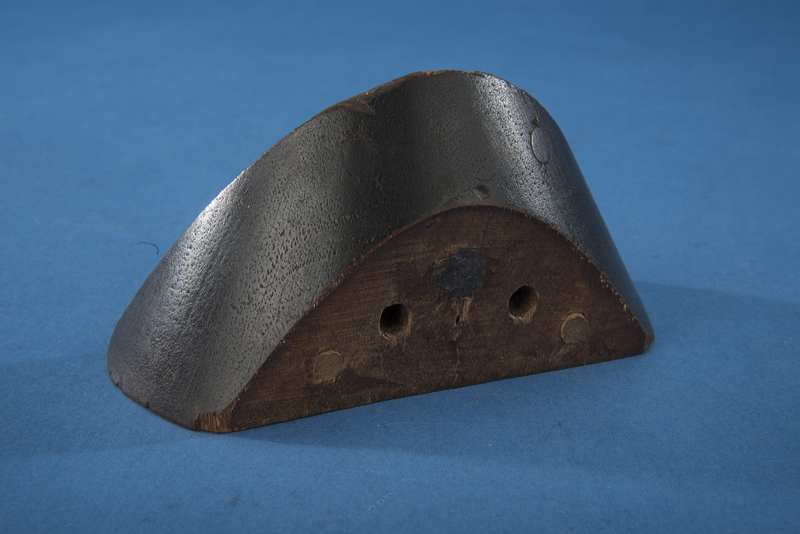 This wooden model is a prime example of an elliptic trammel, often referred to as the Trammel of Archimedes. An oval shape, the ellipse is one of the four conic sections, the others being the circle, the parabola, and the hyperbola. Ellipses are important curves used in the mathematical sciences. For example, the planets follow elliptical orbits around the sun. Ellipses are required in surveying, engineering, architectural, and machine drawings for two main reasons. First, any circle viewed at an angle will appear to be an ellipse. Second, ellipses were common architectural elements, often used in ceilings, staircases, and windows, and needed to be rendered accurately in drawings. Several types of drawing devices that produce ellipses, called ellipsographs or elliptographs, were developed and patented in the late 19th and early 20th centuries. As one of the sliders travels toward the center along its track, the other slider travels outward along its track. By placing a pencil in the bracket at the end of the top beam, a complete ellipse can be drawn. The location of the sliders can be adjusted along the top beam by removing the carved pegs securing the sliders. This changes how far each of the sliders can travel along its track and thus changes the eccentricity of the ellipse. The eccentricity is a number between zero and one that describes how far from circular an ellipse is. A circle has eccentricity zero and an ellipse that is so long and thin that it becomes a line segment has eccentricity one. Trammels are the most common type of ellipsograph and were often made for use in teaching and as children’s toys. Videos of trammels in use and even designs for making your own can easily be found on the Internet. This trammel is fairly large---the beam measures 36 cm (14 ¼ in) long while the tracks measure 19 cm (7 ½ in) each. 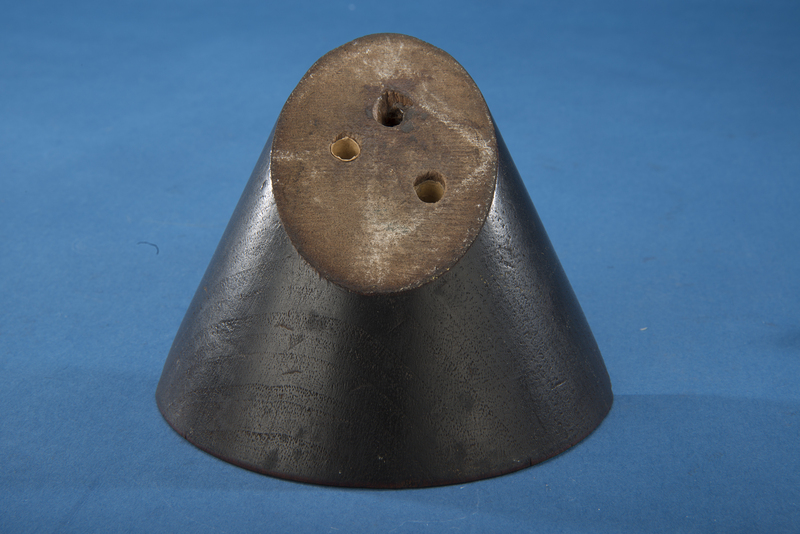 The opening for a writing device is fairly large and has a white residue, so this model may well have been used as a teaching device, possibly held against a blackboard to draw an ellipse using chalk. It has no markings and its maker is unknown, but it was most likely made in the late 19th century. It was a gift of Wesleyan University in Connecticut in 1984. This drawing device is an elliptic trammel, often referred to as the Trammel of Archimedes. An oval shape, the ellipse is one of the four conic sections, the others being the circle, the parabola, and the hyperbola. Ellipses are important curves used in the mathematical sciences. For example, the planets follow elliptical orbits around the sun. Ellipses are required in surveying, engineering, architectural, and machine drawings for two main reasons. First, any circle viewed at an angle will appear to be an ellipse. Second, ellipses were common architectural elements, often used in ceilings, staircases, and windows, and needed to be rendered accurately in drawings. Several types of drawing devices that produce ellipses, called ellipsographs or elliptographs, were developed and patented in the late 19th and early 20th centuries. This device was used by professionals who needed to draw ellipses in engineering drawings or blueprints. It is made of nickel-plated brass and moves very smoothly. Small points on the underside of the device hold it securely to the drawing surface. A reversible writing tip or pencil-lead holder screws onto the adjustable bracket at the end of the top beam. The two screws on each slider allow them to be positioned along the top beam. As the top beam is rotated, the sliders move in opposite directions along their tracks--as one moves inward, the other moves outward--and an ellipse is drawn on the writing surface. The closer the sliders are to each other on the beam, the more circular the ellipse becomes, and the eccentricity of the ellipse approaches zero. The eccentricity of an ellipse is a number between zero and one that describes how far from circular an ellipse is. A circle has eccentricity zero. As an ellipse becomes longer and thinner, the eccentricity approaches one. This model was manufactured (or imported) in approximately 1930 by the Keuffel and Esser Company of New York. It is marked “Keuffel & Esser Co N.Y. Switzerland.” This device first appears as item 1181 in their 1921 catalogue, which states that “This instrument draws ellipses of any shape, from 6 inches to 18 inches major axis, with great accuracy.” It remains available into the 1950s. Two other ellipsographs (items 1178 and 1180) were available prior to this item being offered, but appear to have no longer been available once this item was added to the listing. The “Switzerland” mark may indicate that this device was imported for sale by K&E. The top beam is 22 cm (8 1/2 in) long and can be extended an additional 2.5 cm (1 in). The two tracks are 10 cm (3 7/8 in) long. K&E, was a drafting instruments and supply company that was founded in New York City in 1867 by Wilhelm J. D. Keuffel (1838--1908) and Herman Esser (1845--1908), immigrants from Prussia (what is now far northeastern Germany). Over time the company grew, expanding its products to include surveying instruments and a wide variety of drafting devices, and became well known for its slide rules. In 1987 the company was bought by AZON Corporation. This device was a gift of Brown University in 1973. The Omicron Ellipsograph Model 17 was manufactured by the Omicron Company of Glendale, CA, in the 1950s. An oval shape, the ellipse is one of the four conic sections, the others being the circle, the parabola, and the hyperbola. Ellipses are important curves used in the mathematical sciences. For example, the planets follow elliptical orbits around the sun. Ellipses are required in surveying, engineering, architectural, and machine drawings for two main reasons. First, any circle viewed at an angle will appear to be an ellipse. Second, ellipses were common architectural elements, often used in ceilings, staircases, and windows, and needed to be rendered accurately in drawings. Several types of drawing devices that produce ellipses, called ellipsographs or elliptographs, were developed and patented in the late 19th and early 20th centuries. The U.S. Army purchased several examples of this device for use in surveying and mapping. The Omicron Ellipsograph is not an elliptic trammel like many of the other ellipsographs in the Smithsonian’s collections. This ellipsograph is a linkage, in particular a Stephenson type III linkage. A linkage is a mechanical device made of rigid bars connected by hinges or pivot points that move in such a way as to produce smooth mathematical curves. The most common types of linkages are used to draw true straight lines. See the Kinematic Models in the Smithsonian’s online collections for examples of other linkages. In this ellipsograph, a metal bar is attached to two sliding brackets. One is on the stationary bar that runs horizontally across the device and is the major axis of the ellipse. The other sliding bracket is attached to a curved arm. A pencil is inserted through the hole at the top end of the bar. As the pencil is moved, the linkage articulates at five pivot points (the two adjustable sliders and three pivots as seen in the image). This constrains the pencil to move in an elliptic arc. Unlike the elliptic trammel, only half an ellipse can be drawn with this device, making it a semi-elliptic trammel. It can be turned 180 degrees to draw the other half of the ellipse. Although this device cannot draw a complete ellipse in one motion, it does have the advantage of being able to draw very small ellipses. By adjusting the distance between the two slider brackets, the eccentricity of the ellipse can be changed. Eccentricity is a number between zero and one that describes how circular an ellipse is. By moving the slider brackets closer together, the eccentricity of the ellipse is reduced, creating a more circular ellipse. As the brackets are moved farther apart, the eccentricity is increased and a more elongated ellipse is produced. 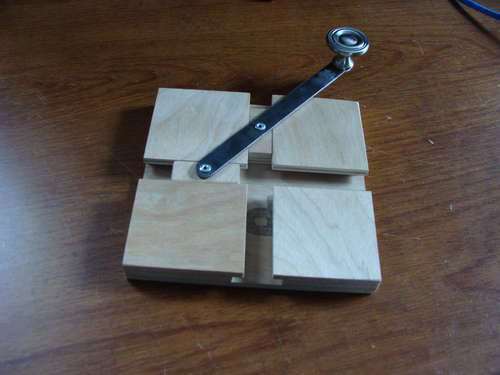 Several demonstrations of how an elliptic trammel works are available online. Comparing the slider motion of the elliptical trammel and the linkage ellipsograph highlights the similarities of the motion of these two ellipsographs. Both devices constrain the motion of the sliders so that as one moves inward on a straight line, the other slider moves outward on a straight line perpendicular to the first. Thus both types of ellipsographs produce an elliptic curve using the same mathematical theory, but incorporating different physical configurations. The Omicron Ellipsograph is made of aluminium and steel on an acrylic base. The base is 18.5 cm by 8.5 cm (7 1/4 in by 3 3/8 in). The top bar is 18 cm (7 in) long. The whole linkage rests on the central pivot directly above the company logo. It can draw ellipses with major axes up to 12 inches long. Antique Drawing Instrument Collection, http://collectingme.com/drawing/. John Byant, Chris Sangwin, How Round is Your Circle? : Where Engineering and Mathematics Meet, Princeton: Princeton University Press, 2008, p. 290. This brass device is a patent model for a “new and improved instrument for drawing curves and figures approximating in form ovals” (U.S. Patent 22910, February 8, 1859). An oval shape, the ellipse is one of the four conic sections, the others being the circle, the parabola, and the hyperbola. Ellipses are important curves used in the mathematical sciences. For example, the planets follow elliptical orbits around the sun. Ellipses are required in surveying, engineering, architectural, and machine drawings for two main reasons. First, any circle viewed at an angle will appear to be an ellipse. Second, ellipses were common architectural elements, often used in ceilings, staircases, and windows, and needed to be rendered accurately in drawings. For this reason, several drawing devices that produce ellipses, called ellipsographs or elliptographs, were developed and patented in the late 19th and early 20th centuries. Developed by Thomas William and William Joslin of Fishersville, Connecticut, in the 1850s, this invention consists of a circular disc that freely moves along the slot in the base of the model as it rotates. The base of the steel arm is fixed while the point fits by means of a pin into one of several holes in the disc which are at various distances from the center. The shape and movement of the arm is reminiscent of an hour hand on a clock. Attached to the bottom of the disc is an armature that can be set in various positions and has an attachment for a pencil. As the disc is rotated by hand, the arm is constrained to move side to side. This in turn forces the disc to move in a perpendicular direction along the slot. Finally, the pencil arm below the disc will move in an elliptical path. By changing the connection point of the arm on the disc as well as the distance of pencil is from the center of the disc, ellipses of different sizes and eccentricities can be produced. The Smithsonian also owns the 1852 patent model of a machine for making cordage designed by William Joslin (U.S. Patent 8825). This model was transferred to the Smithsonian from the U.S. Patent Office in the early 20th century along with several other patent models. This ellipsograph is a beautifully engineered drawing device. An oval shape, the ellipse is one of the four conic sections, the others being the circle, the parabola and the hyperbola. Ellipses are important curves used in the mathematical sciences. For example, the planets follow elliptical orbits around the sun. Ellipses are required in surveying, engineering, architectural, and machine drawings for two main reasons. First, any circle viewed at an angle will appear to be an ellipse. Second, ellipses were common architectural elements, often used in ceilings, staircases, and windows, and needed to be rendered accurately in drawings. Several types of drawing devices that produce ellipses, called ellipsographs or elliptographs, were developed and patented in the late 19th and early 20th centuries. Manufactured by William Ford Stanley and Co. Ltd in the 1880s, this device was designed and patented by English inventor Edward Burslow (often seen as Burstow) in the early 1870s. Burslow lived in Horsham, England, and along with other drawing devices, invented a pentacycle for the Horsham Postal Service in 1882. Though it did not catch on for use elsewhere, the Horsham postal workers wrote Burslow a letter of appreciation for the five-wheeled contrivance. William Ford Robinson Stanley (1829--1909) was an English inventor and philanthropist with multiple patents in England and the United States. He founded his company, which made precision mathematical and drawing instruments, among other items, in 1854 after a comment by his father about the poor quality of British technical instruments. The company continued to produce drawing and surveying instruments through the 20th century, closing its doors in 1999. The Stanley/Burslow ellipsograph works on a very different principle than the more common elliptical trammel. Like the H. R. Corkhill ellipsograph in the collection, it uses a series of gears to move five linked arms. As the top arm is rotated, the two main arms with three gears apiece separate into a Y configuration, pulling the bracket below the device along the slot in the main horizontal beam. Into this bracket can be placed two ruled arms of different lengths to produce ellipses varying in size, from 1/4 in by 1/2 in (minor/major axis lengths) to 7 in by 14 in. Interestingly, the ellipses are drawn on a diagonal beneath the device and not in line with it. This allows larger ellipses to be drawn. This device was transferred to the museum by the Smithsonian Astrophysical Observatory in 1956. Resources: Great Britain Patent Office, Patents for Inventions: Abridgments of Specifications Period A.D. 1867-76, London: Darling and Son, 1904, p. 48. William B. Owen, “Stanley, William Ford Robinson,” Dictionary of National Biography, 1912 supplement, pp. 393--394. British Postal Museum and Archives. This device is a patent model by H. R. Corkhill Jr. for an ellipsograph. Patent 492,142 was granted on February 21, 1893. “Be it known that I, HENRY CORKHILL, Jr., of Rochester, in the county of Monroe and State of New York, have invented a new and useful improvement in Ellipsographs […] The object of my invention is to produce a device for conveniently and accurately tracing ellipses, which possesses certain advantages over similar devices heretofore used” (U.S. Patent application, March 26, 1892). Corkhill, of Rochester NY, appears to hold several other U.S. patents for various devices such as cigarette boxes, machines for making labels, and machines for folding paper tubes. His father, Henry R. Corkhill Sr., also holds several U.S. patents. Henry Jr. was born in approximately 1840 and lists his profession as machinist in census records. An oval shape, the ellipse is one of the four conic sections, the others being the circle, the parabola and the hyperbola. Ellipses are important curves used in the mathematical sciences. For example, the planets follow elliptical orbits around the sun. Ellipses are required in engineering, architectural, and machine drawings for two main reasons. First, any circle viewed at an angle will appear to be an ellipse. Second, ellipses were common architectural elements, often used in ceilings, staircases, and windows. For both of these reasons, ellipses needed to be rendered accurately in drawings. Several types of drawing devices that produce ellipses, called ellipsographs or elliptographs, were developed and patented in the late 19th and early 20th centuries. U.S. Patent records, Google Patents. This is the patent model for a drawing devices granted U.S. Patent 21,041 to William W. Wythes on July 27, 1858. “Be it known that I, WILLIAM WYTHES, of the city of Philadelphia and State of Pennsylvania, have invented a new and Improved Instrument for Drawing and Copying.” (U.S. Patent Application). The Smithsonian also owns a patent model by Wythes for a cloth-measuring machine (U.S. Patent 18313). (The original patent drawings and descriptions can be viewed at Google Patents.) Special about this patent model is that the inventor has engraved “Wm W Wythes, inventor” on the large brass disc on the model. Wythes was awarded a degree in medicine from Philadelphia College of Medicine in July 1851. He served as an assistant surgeon in the U.S. Volunteers, part of the Union forces, during the Civil War and was singled out in the Official Records of the Union and Confederate Armies, 1861--1865, as having been a notable member of the Asylum General Hospital in Knoxville during the war. An oval shape, the ellipse is one of the four conic sections, the others being the circle, the parabola, and the hyperbola. Ellipses are important curves used in the mathematical sciences. For example, the planets follow elliptical orbits around the sun. Ellipses are required in surveying, engineering, architectural, and machine drawings for two main reasons. First, any circle viewed at an angle will appear to be an ellipse. Second, ellipses were common architectural elements, often used in ceilings, staircases, and windows, and needed to be rendered accurately in drawings. Several types of drawing devices that produce ellipses, called ellipsographs or elliptographs, were developed and patented in the late 19th and early 20th centuries. The inventor claimed that the device could draw not only ellipses, but also epicycloids and spirals, thus the “cylco" in the title of the model. An epicycloid is the curve traced by a point on the circumference of a circle as it rolls about another circle. (See Schilling models 1982.0795.01, 1982.0795.02, 1982.0795.03, and 1982.0795.05 in the National Museum of American History collection.) As the name also implies, this device could be used as a pantograph, a mechanical devices used to copy line drawings. As the original drawing is traced, the pencil attached to the opposite end of the devices produces, through a series of linkages, a copy. The copy can also be scaled up or down in size. One common application of a pantograph (before the advent of computers) was to reduce the size of a drawing for use in minting money. For example, the original line drawings found on U.S. bills were full-size drawings. They were reduced and etched in order to be printed. Pantographs were also used, notably by Thomas Jefferson, for making a copy of a letter as the final draft of the original was being written out. The Wythes Cyclo-Ellipto-Pantograph consists of a wooden beam of 38 cm (15 in) long. At one end is a large vertical brass disc with gear teeth on the back. This gear turns a horizontal disc that is attached to a brass beam under the device. There are two movable pieces along the beam. One is the pivot point of the device, under the wooden handle. The other is the writing point below the horizontal brass disc placed along the beam. As the large disc at the end of the beam is turned, the gears cause a chain (similar to a miniature bicycle chain) to circulate along the length of the beam. As the long brass beam beneath the device turns, the smaller brass beam below the movable disc traces a similar shape. By adjusting the location of the pivot point and the small horizontal disc, various shapes are formed. However, it is not clear that all the claims of the inventor are warranted. It appears that only portions of curves or ellipses can be generated. The device was offered in the J. W. Queen “Illustrated Catalogue” of 1859. Announcement of the Philadelphia College of Medicine, for the Collegiate Year, 1854-5, (Philadelphia: King and Baird, 1854), 13. Official Records of the Union and Confederate Armies, 1861-1865, (Washington, D.C.: National Archives, Microcopy 262, 1959), 537.